Bellafaire, Judith A. (1972). 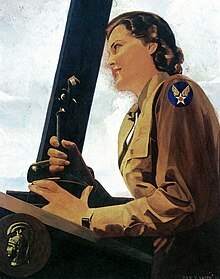 The Women's Army Corps: A Commemoration of World War II Service. Washington, DC: United States Department of the Army. http://www.army.mil/cmh-pg/brochures/wac/wac.htm. Campbell, D'Ann (1986). Women at War with America: Private Lives in a Patriotic Era. Harvard University Press. ISBN 0674954750. Earley, Charity Adams (1989). One Woman's Army: A Black Officer Remembers the WAC. Texas A&M University Press. ISBN 089096694X. Holm, Jeanne (1994). Women in the Military: An Unfinished Revolution. Presidio Press. ISBN 0891414509. Meyer, Leisa D. (1992). Creating GI Jane: Sexuality and Power in the Women's Army Corps During World War II. Columbia University Press. ISBN 0231101457. Moore, Brenda L. (1997). To Serve My Country, to Serve My Race: The Story of the Only African-American WACS Stationed Overseas During World War II. New York University Press. ISBN 0814755879. Morden, Bettie J. (2000). The Women's Army Corps, 1945-1978. United States Department of the Army. http://www.army.mil/cmh-pg/books/wac/index.htm. Putney, Martha S. (1992). When the Nation Was in Need: Blacks in the Women's Army Corps During World War II. The Scarecrow Press. ISBN 0810840170. O'Neill, William (1993). A Democracy at War: : America's Fight at Home and Abroad in World War II. Harvard University Press. ISBN 0674197372. Treadwell, Mattie E. (1954). The Women's Army Corps. United States Department of the Army. http://www.army.mil/cmh-pg/books/wwii/Wac/index.htm.